00:50:00 4 servings, 6 wedges (250 g) each. 4 servings, 6 wedges (250 g) each. 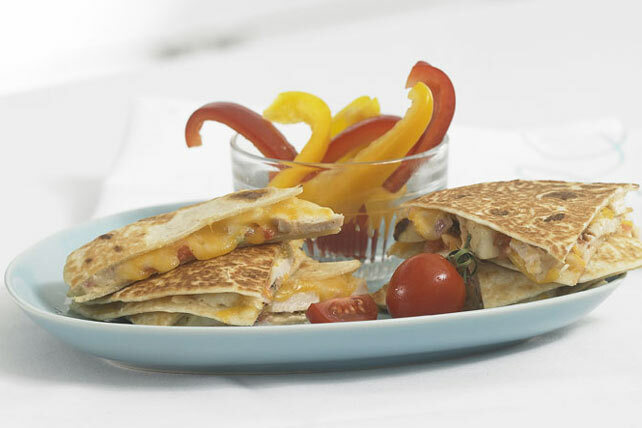 These meltingly good quesadillas, which can be put together in a flash, and are a fiesta of flavour! Mix salsa, Miracle Whip and chili powder; spread onto tortillas. Layer chicken and cheese on half of each tortilla; fold in half. Heat large skillet sprayed with cooking spray on medium heat. Add quesadillas, 2 at a time; cook 4 to 5 min. on each side or until lightly browned on both sides. Repeat with remaining quesadillas. Cut each quesadilla into 3 wedges to serve. Substitute 4 Kraft Singles Cheese Slices for the shredded cheese. Garnish each wedge with 1 tsp. sour cream. Serving Size 4 servings, 6 wedges (250 g) each.